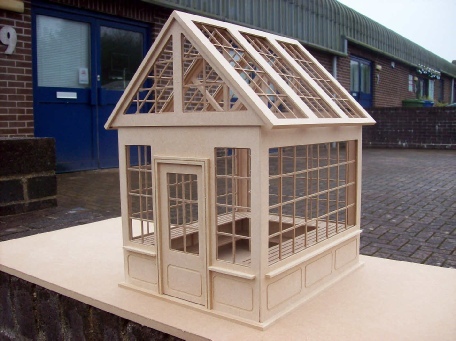 This building is our own design and is available as a kit only. All components within the kit are manufactured utilising the latest computer controlled CNC technology. The main door is hinged using 10 mm brass hinges. All windows have both an inner and outer sill to enable you to fit your own glazing. The potting benches are also included with the kit. The roof section shows all the inner details with the beams being exposed. The roof section also lifts away from the main building. Easy to follow assembly instructions with photographic images are included. Due to the complex detail of some of the components, this kit is not suitable for children under the age of 14 years without adult supervision.